Begin by cooking the sweet potatoes. I bake them because when you boil them you lose more nutrients and I like my pies healthy…? If you bake them, peel the potatoes and cut them into slices before baking so they bake faster and are easier to mash. Put them on foil and bake at 375 for about 30 minutes or until the potatoes are soft. Boiling is faster and sometimes you gotta do what you gotta do. If you boil them, boil them with the skin on and when they’re done you can peel them right into the mixing bowl. It is super easy when boiled and the sweet potatoes are actually easier to mash in my opinion. Not to mention it pulls out some of the stringy fibers. Mash the sweet potatoes using a hand mixer or your super strong arms. Go ahead, flex a little. Mix in the spices and brown sugar. Don’t even think about using granulated sugar. That has no place in this pie. It is going to be pretty thick, so hang in there. Add in the melted butter and eggs and mix again. If you get any stringy fibers from the potatoes as you mix, just pull them out because no one wants a stringy sweet potato pie. 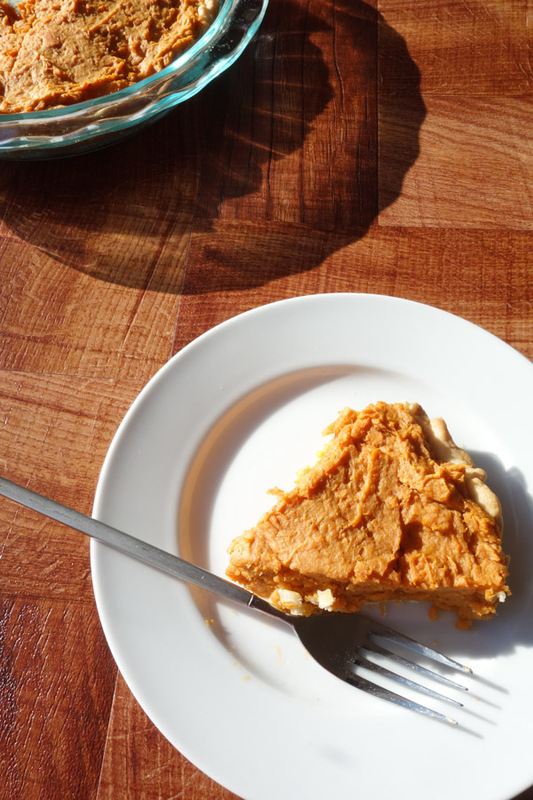 Stringy sweet potato pie is for amateurs and you are not an amateur! When everything is all mixed, you can use an immersion blender if you want a really smooth pie. I like mine to have a little texture. Look, you’re almost there! Once you mix all of your ingredients, roll out your pie crust on a lightly floured surface to the size of your pie plate. I used a store-bought pie crust for this pie. I would’ve loved to make one from scratch, but it is the end of the billing year and ain’t nobody got time for that. So, I’ll share the recipe I like for homemade pie crusts another time. Place the pie crust in your pie plate and add the sweet potato filling. Spread the sweet potato filling evenly in the pie crust. The top will not be perfectly flat nor should it be. My mom’s pie is always a perfectly imperfect and I love it that way. It will not be as runny as a pumpkin pie. Do not be alarmed, it will be great! After spreading the sweet potato filling in the pie crust, you’re ready to bake! Bake the pie until the crust and sweet potatoes begin to brown. Serve the pie hot. Or cold. Really just however it makes it from the pie plate to your mouth. Between the sweet potato pie and biscuits this week, we’re taking a tour of lightened up southern cooking! Cook sweet potatoes. If cooking in oven, peel potatoes and cut into large chunks. Cook in a 375 degree oven for approximately 30 minutes or until the potatoes are soft. If boiling, boil with skin on until soft, approximately 15 minutes. When sweet potatoes are cooked, mix together in large bowl with spices and sugar. Mix with a hand mixer or by hand. Melt butter in small bowl and add to sweet potato filling. Whisk eggs and mix into sweet potato filling. Mix filling with hand mixer or by hand for around 5 minutes to make filling smoother. Roll out pie crust and layer unbaked pie crust in pie plate. Add sweet potato filling to the pie crust and bake for approximately 40 minutes. you are so right – sweet potatoes are so overlooked and what a brilliant way to give them the spotlight!